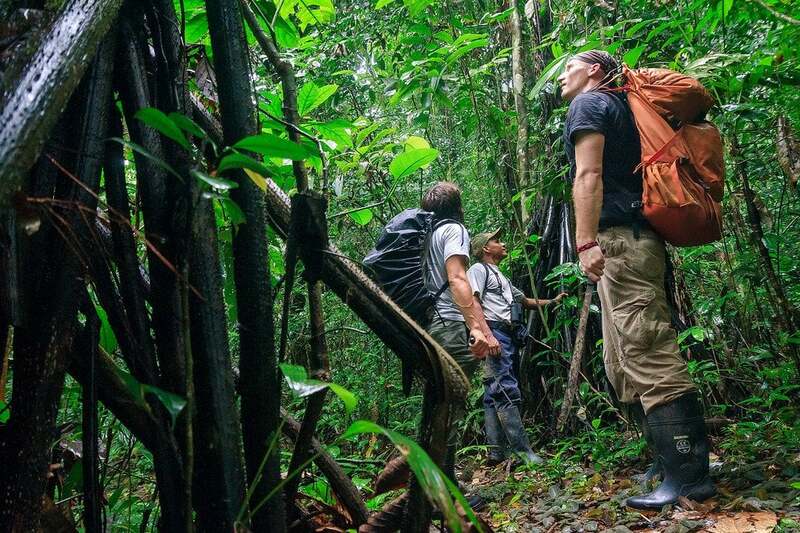 The Darien Gap is a remote, roadless swath of jungle on the border of Panama & Colombia. Known as a drug smuggling corridor between the two countries, it’s rarely seen by outsiders. When asked what my favorite experiences are after 7 years of world travel, I usually describe camping on an erupting volcano in Guatemala, or my journey into the Darien Gap. The Darien has an almost mythical quality to it — a mysterious land full of exotic plants, rare wildlife, indigenous people, and dangerous paramilitary groups. Largely untouched by the modern world, the Darien is one of the least visited places on the planet. In the Fall of 2011 I spent 5 days exploring the Darien Gap with a friend. Cutting my way through this formidable wilderness with a machete to discover if these myths were true. I hope my photos give you a fascinating glimpse into this unique part of Latin America. 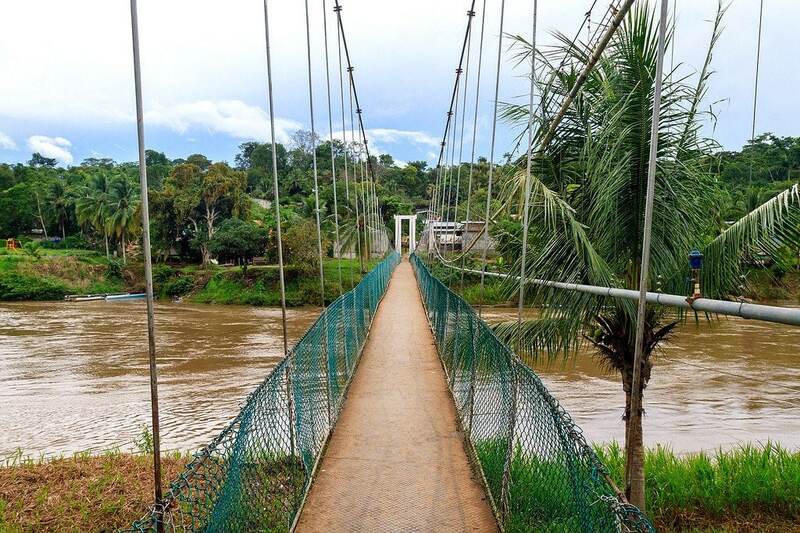 This simple footbridge in the town of Yaviza marks the only break in a 29,000 mile stretch of road known as the Pan-American Highway, reaching down from Alaska to Argentina. This 100 mile section of impassible jungle between Central & South America is called the Darien Gap. 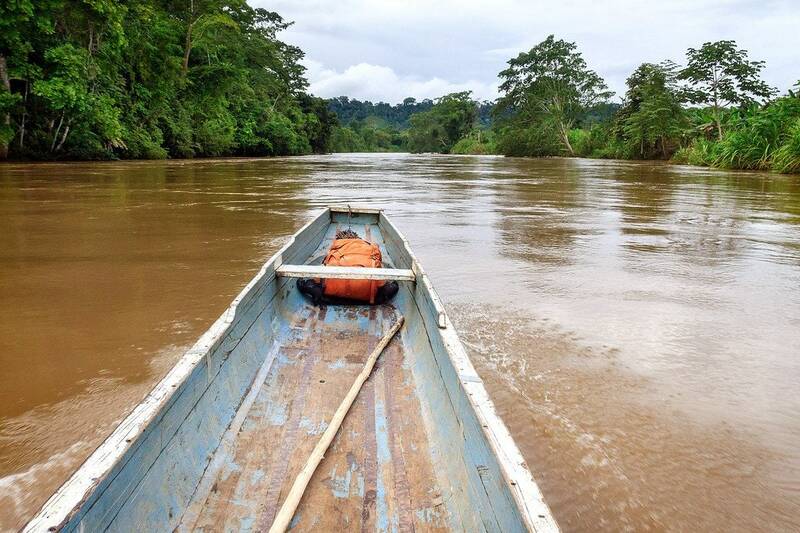 Most of the Darien rainforest is roadless, so long Piragua canoes like this are the primary mode of transportation. Locals with some money are able to afford an outboard motor for it. But most propel themselves along with hand-made wooden paddles — which can be difficult due to strong river currents. 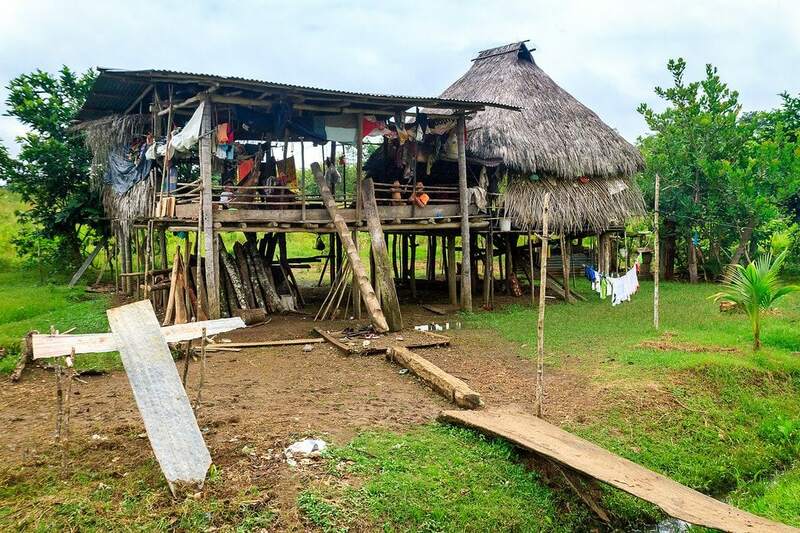 The Emberá Indians build their homes up on stilts to protect against animals and flooding. The log ladder serves two purposes, along with providing access to the home, if the notches are facing out visitors are welcome — if they are rolled under it means “do not disturb”. 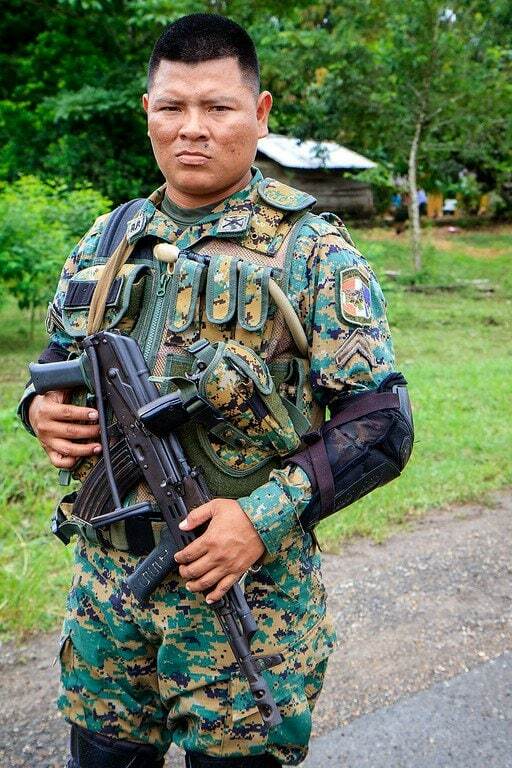 These guys may look like military soldiers, but technically they are Panama’s elite border police called Senafront. Drug smugglers use the Darien to transport their goods over the border from Colombia. Access to most of the Darien without Senafront’s explicit permission is impossible. The Darien is home to many different species of poison frogs. While I’m not sure, this is possibly a Harlequin Toad — also known as a clown frog. The scientific name is Atelopus Varius. If that’s what it is, these frogs were thought to be extinct in Panama! Any frog experts out there? The Darien rainforest is a National Park and UNESCO World Heritage Site. With proper permissions you can go hiking and camping inside, as we did. It doesn’t get many visitors these days though, so a machete is useful for clearing overgrown trails. Watch Out for Dangerous Critters! There are all kinds of creatures in the Darien jungle that can be dangerous. 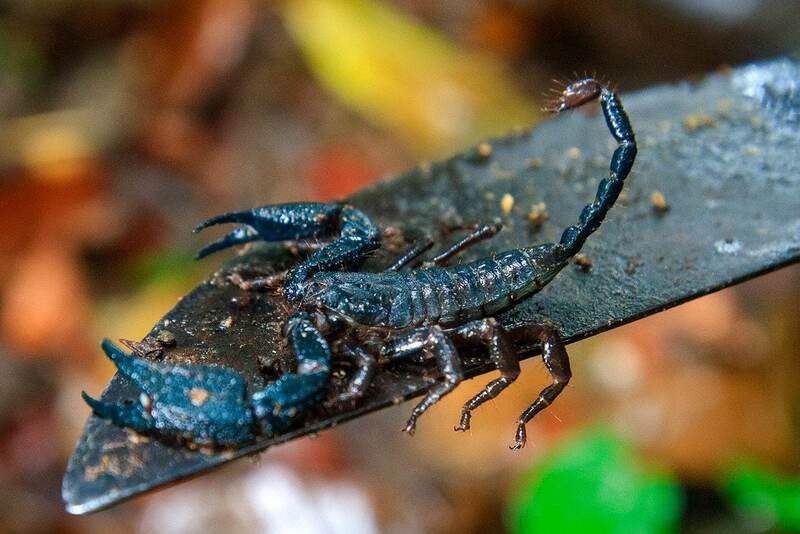 Like this black scorpion we found hiking. The area is also home to painful fire ants, deadly fer-de-lance snakes, jaguars, bot flies which lay eggs under your skin, wild pigs, and other animals you probably don’t want to meet. This tree does not like to be hugged. You’ve been warned hippies! 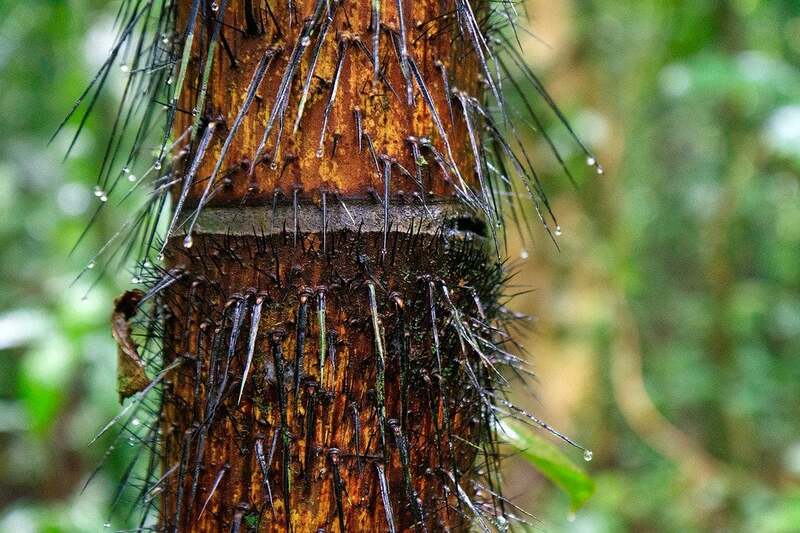 The Chunga Palm (also called Black Palm) is found throughout the rainforests of the Darien. Their long, very sharp, bacteria-covered spines can be pretty nasty if you’re not careful. Contracting a horrible infection in the middle of the jungle is not recommended. 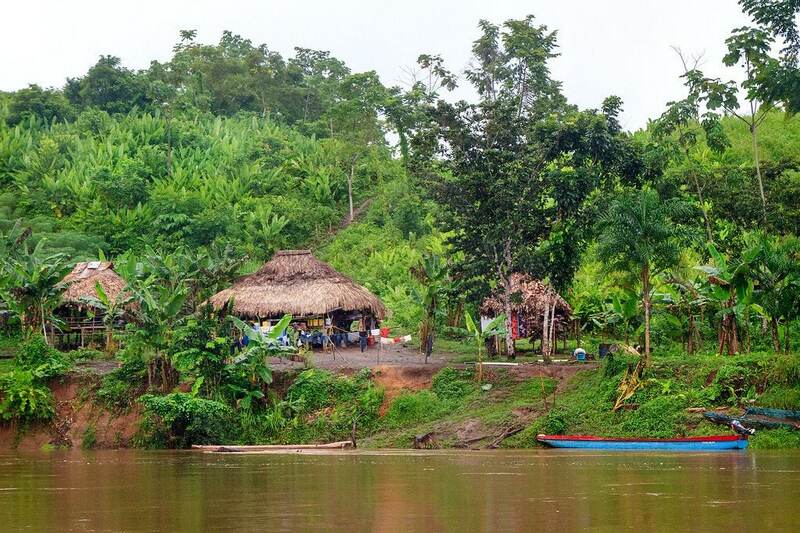 Many indigenous people who live in the Darien earn money growing plantain bananas, which are then shipped upriver to Yaviza and eventually sold in Panama City. This is a relatively new development though, as money was not a priority before hunting was banned in the National Park. 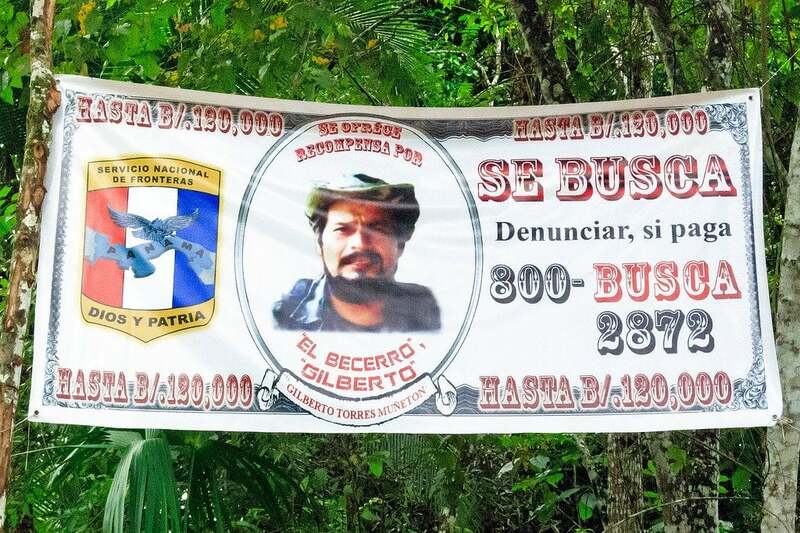 Meet Gilberto Torres Muñetón aka “The Calf” a commander of the notorious Colombian FARC anti-government guerrillas. Wanted for drug trafficking, arms smuggling, kidnappings, and a bombing that killed 80 people along the border of Panama & Colombia. We saw quite a few of these wanted posters. Private Wilson here guards a Senafront checkpoint on the road into the Darien. 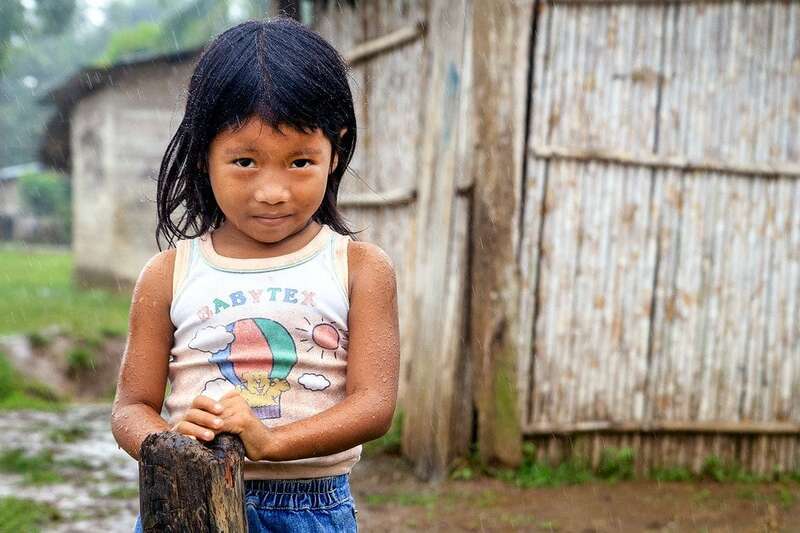 The Panamanian Government is trying to re-claim the jungle from smugglers, bandits, and paramilitary groups. So there are plenty of camouflage uniforms & machine guns around. One day our Kuna guide Isaac took us hand-line fishing on the Turia River outside the village of El Real. 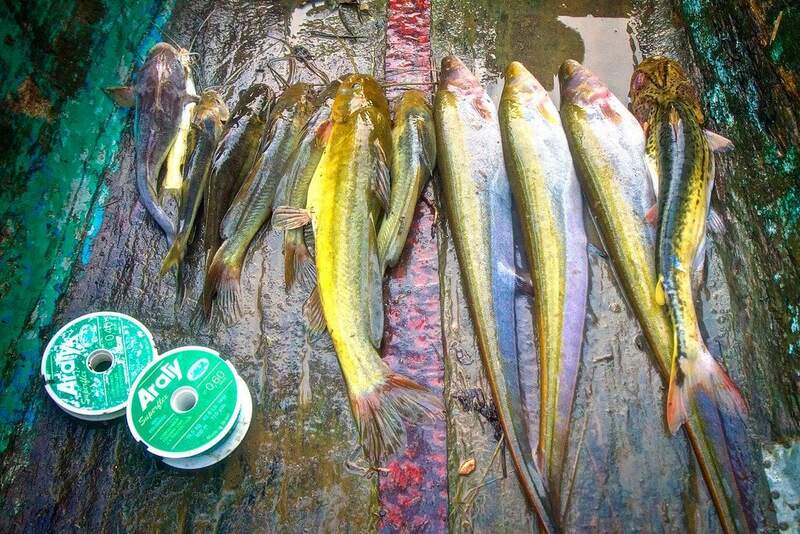 This was our catch that afternoon, some of which we proceeded to cook up and eat for dinner. The rivers are absolutely full of fish! Throw your line in and 1 or 2 minutes later something was attached to it. This is Mariana, she stopped by to say hello along with her husband. They showed off some of their handicrafts, like this colorful Mola bag. 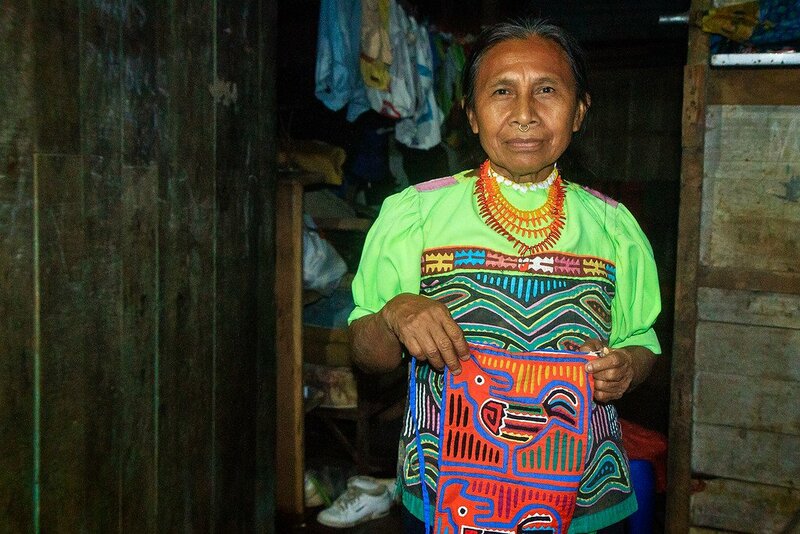 The Kuna are just one of 3 major indigenous groups that call the Darien jungle home. The others are called the Embera and the Wounan. 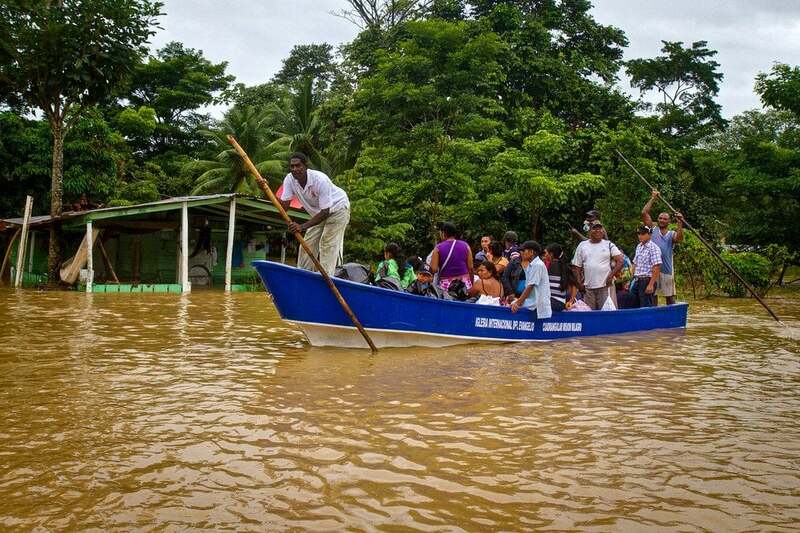 Flooding is a big problem during the rainy season in Darien Province. I experienced this first-hand when trying to leave the area. A river broke its bank and submerged the road, forcing everyone to pay for boat rides over to the next dry section of land about 300 yards away. The Darien isn’t only populated with indigenous people. 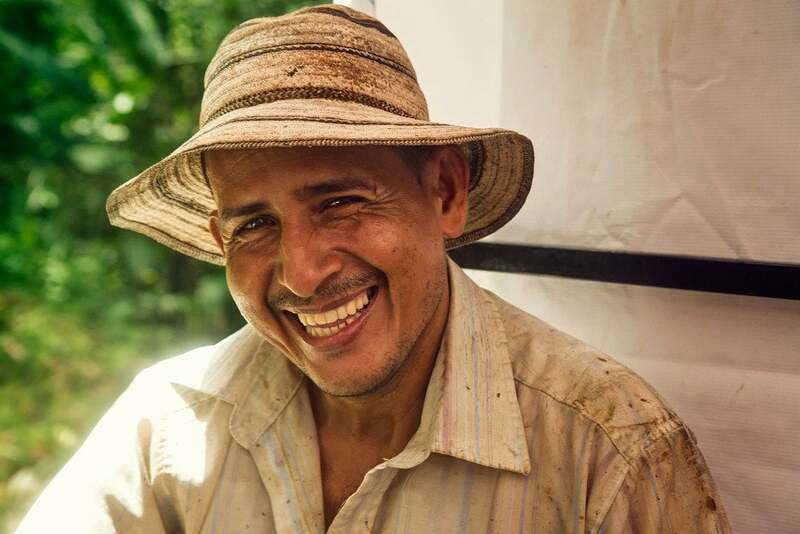 Panamanians and Colombians have moved into the area to start plantain banana farms, cattle ranches, and logging operations. This local farmer ended up hitchhiking with us in the back of a truck, his horse trotting along behind. The heat, humidity, and plant life of a rainforest will destroy anything in its path. Like this old house. Sunlight is prime real estate, and everyone (and everything) wants in on the action. If left alone this building would quickly get eaten-up by the jungle. 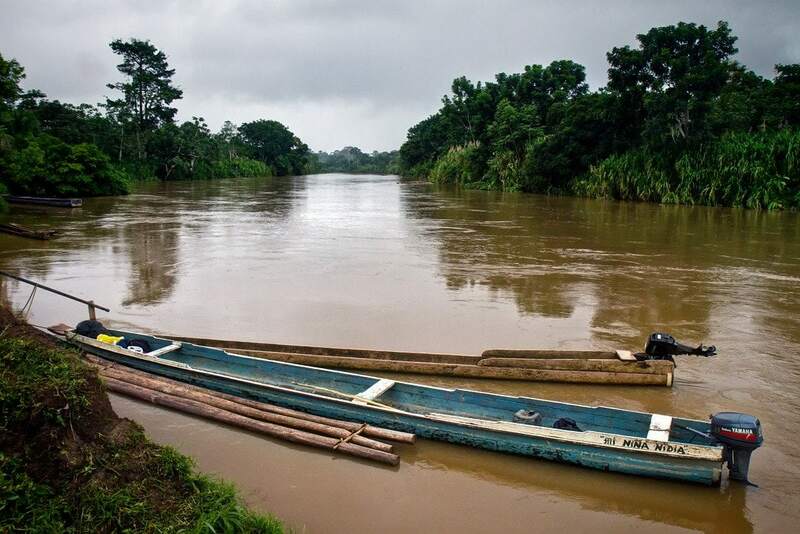 This is the mighty Turia River, a main artery of transportation in the Darien Gap. The river is dark & swollen from heavy October rains. We slowly motored up the river for 5 hours heading to the village of Boca de Cupe, where I was soon expelled by Senafront soldiers who feared for my safety. 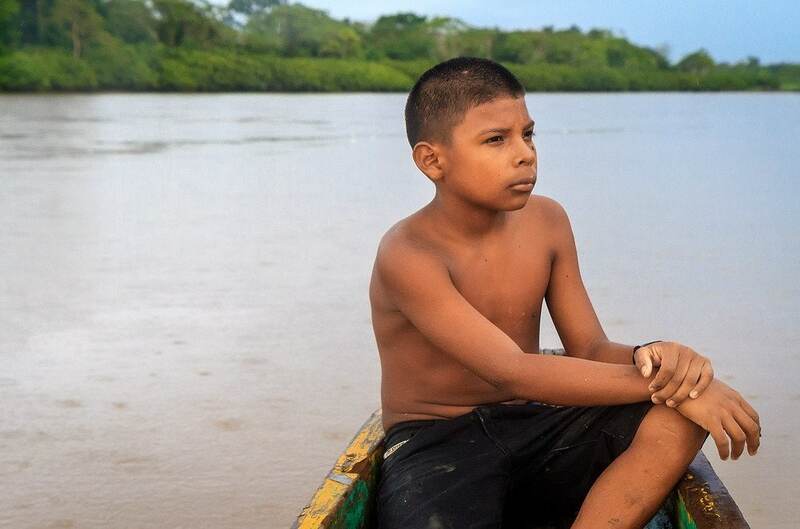 Have you ever heard of the Darien Gap? Do you have questions? Drop me a message in the comments below! I read your posts, you are amazing with your travels. Can I ask you, how did you get in contact with Senafront before your trip? I would like to travel to La Palma and visit the village of Mogue at the edge of the Darien province, but I am not able to find any contact to Senafront (only the website, but no address or email address) for the permission to go there. Thanks in advance for your help and have fun while your travels. I don’t remember the exact address, other than it’s in Corozal. Taxi drivers will know where. That’s how I got there. I know a few cubans who got flown out, into Guyana, from Guyana they went thru the Darien Gap with guides helping them along the way. This was 2 yrs ago, and they now live in Arizona, and few others live in Texas. So many refugees are travelling thru the Darien Gap. Its not a place to make friends with. I’ve heard many horror stories. A good post I will be heading to the province for a 3rd time this year I will be travelling Via Colombia from the pacific coastal town of Jurado northward up in to Jaque. Just to let you know that the real length of the Pan-American highway is 48 000 km. This is the distance 98 % of us in the world will understand. Talk about a sassy comment Daniel Jackson! Thanks for posting this, I enjoyed your account and pics as I hiked the Darien Gap in 1986. I still have my old passport with the unusual entry stamp from Boca de Cupe. I don’t know if much has changed geographically in the area, it doesn’t sound like it, in which case Leland, go on foot, don’t take a dune buggy – either the jungle or FARC will take it from you. What an interesting adventure! My boyfriend is looking to hike through the Darien Gap, which I had never heard of before. During my research, I came across your article and I am very intrigued (and honestly a little nervous because of all of the poisonous things out there). Thanks for providing so much insight! My bucket list includes completion of the Pan American Highway. I would like to take a dune buggy through the gap. The buggy has quick connect pontoons for river crossings. How do I get permission to travel through the gap? You never ask permissions. Asking permission is why all this happens. Police=mafia. Contact Senafront and the Panamanian Government to get permission. You will also need to get permission and help from the Kuna Indians. Get a fixer. It takes money and time. Don’t try to attempt it without permission. You may be able to slip past on the Panamanian side, but the Colombians will turn you around and make you go back. You took very beautiful and interesting pictures. You didn’t say if it were possible to drive the gap completely? Love your information and great pictures, that I believe you should make a book and publish it. Ca you send some information about the Darien Gap? We would love to go there in 2-3weeks. Is it posible to go there in the rain seaso ? Do you know a good guide? Thanks for sharing! I would like more information on crossing the Darien Gap. I enjoyed your comments and pictures. Where exactly have you been in the Darien Gap? I’m looking into going there, and try to get as much info as possible. Did you have any trouble entering the area? Safe for male and female travelers? How far apart are the villages? What supplied did you bring/would you recommend? What other wildlife did you encounter besides what your blog outlined? Until I just learned about the Darien Gap. I had never heard of it. It’s one of the most interesting places I’ve read about that I have no desire to ever visit. I hate bugs, snakes, insects etc. Excellent photos and article! I just purchased my tickets for Panama and I hope to visit the Darien on my trip. What is the best way for a gringo to get the Darien area from Panama city? Are there daily buses to the area? Thanks. I’ve traveled the general area and once tried to make it from Panama City to Colombia, by road. I quickly learned it wasn’t possible. I was even married to a girl from Ecuador and we lived there together. Some time later I was in a poker game listening to a guy who had traveled the general area too and how he drove the same route into Colombia. And how great it was. It was literally fun busting his chops in front of the other players when I told him it was impossible to do it and why. . He got up and left the game embarrassed. Hi John! How are you? Hope you’re well. How could I get in touch with you? I’m involved in an expedition that might go via some of the towns you mention. Even if this was in the 90s, I’d really like to speak to you about them! Reach me on [email protected] – thanks. I walked the Darien in 1988 – we did the most impossible way. I’m writting a story about it (asked by a publicer) and like to talk/write with people who’ve been there too. Greetz: Paulito, Rotterdam, the Netherlands. Loved the photos and the commentary. 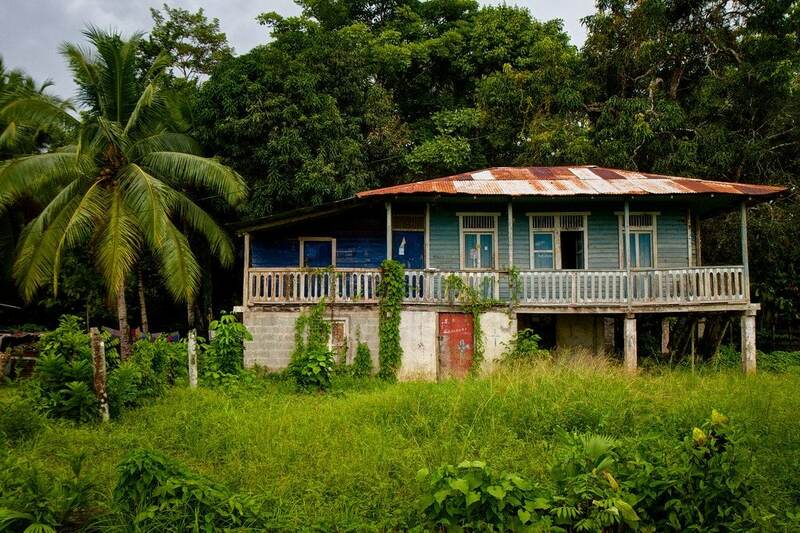 Especially liked the photo of the old house almost consumed by the jungle. Don’t know why, just liked it!, well done. Thanks. Hey Martin! Thanks so much for sharing your Darien story here with us. I would have loved to trek in further to Paya, but the military and locals warned me it wasn’t safe. Hopefully one day things will calm down in there. Just spent two weeks with an experienced guide in this region of the Darien. We flew into the abandoned Cana site and hiked the Pirre Ridge and around to the summit of Mt. Nique then back down to the headwaters of the river and then north to Boca De Cupe on foot. I twisted my ankle on the second to last day and had to ride a horse the last 25K. Spent the night in Boca De Cupe after checking in with Senafront then hired a Piragua down river to Yaviza. 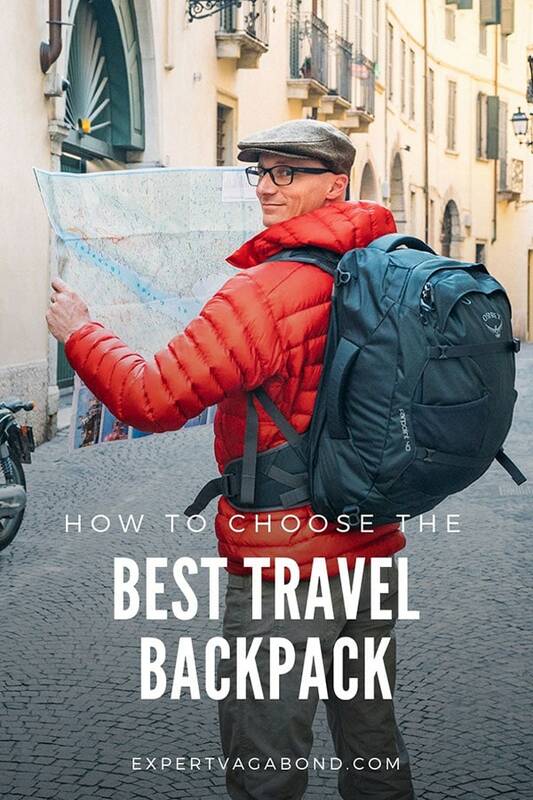 My suggestion is this: Hire an experienced guide service. Have several people with you that know the local terrain and language. Jump through all the necessary park and senafront hoops up front….it will save you much much hassle. Be in really good shape. 50k in the jungle lowlands, ravines, and mountains is no cakewalk. There is not much in the way of help out there…at least till you can get to flat ground. Your feet may be the only thing that can get you out! Carry gps,compass, decent maps, spot locator, sat phone, good field tested equipment and first aid kit. I was wondering how did you find your guide? Is it best to search for one in panama city and so yes where did you find the right guide? Hi, Sounds like quite the adventure! I’m curious where you found your guide as well. Or Daniel if you have found out any information you could share that would be great! If you show up at Panama City or worse Yaviza and ask for a guide you will find one but they may be opportunists that don’t really know the area and are simply looking for a quick buck or worse a shady character intending who knows what. My guide was a man named Rick Morales……….trekking the jungle is all he does and he is very good at it. I seriously enjoyed your shared adventure so much. I’ve been to so many interesting places in my years, spent a year in five different countries in Africa, five months in Uruguay, ten days in Alaska, etc… I love travel, love people, cultures, adventure, life outdoors. Even just reading other’s adventures gives me a sense of contentment knowing that there is a world out there yet to explore. I was in a car wreck shortly after our return from Uruguay and am now three years later we are ready to go back to look for land because we fell in love with the place. I had considered driving and trying to take our fifth wheel that way but that is not an option…although I’m the type that would love to do it on enduro’s or in a Volkswagen TDI …I think we may end up flying only because we don’t speak fluent spanish. I’m learning via Rosetta Stone but at my age, it will be a work in progress until immersion forces the issue I think. Thank YOU for sharing and putting a huge smile on my face and a joy in my heart and keeping the passion for future adventures alive. I have traveled Pan-American hwy. to Prudhoe bay, Deadhorse and back to Los Angeles. It was many years ago and I loved the trip, but it wasn’t as challenging as some people said. The time had passed. I have done other things, including being dead after very bad accident. Luckily enough I came back and now I am ready to drive the southern part of Pan-American hwy. and yes; cross the Darien Gap, or at least attempt it. I am looking for all the information about that area as well as anything pertaining to that trip. Also if somebody is interested to join me as a caravan with one or two vehicles, I am open to discuss this option as well. As far as driving with me, I will have a room for one person. I can be contacted at [email protected] or at (949) 212-9645 and I trust that nobody will make me regret leaving my contacts. Happy and safe travels and as we pilots say – Blue Skies. Wow, nice photo shoot! Me and my crew will be going there at Darien National Park to explore the nature and to collect some tarantulas. Your pictures definitely do justice to this gorgeous place. I may well consider going back to Panama to visit the Darien! Thank you for this lovely photo essay! If you really do, maybe you would consider joining me. 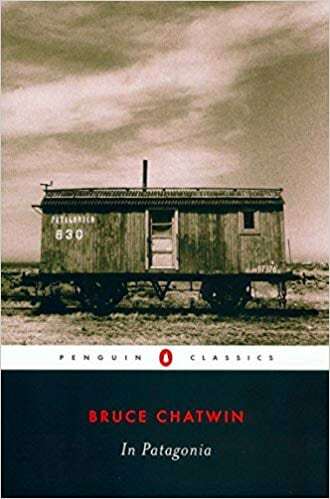 I have just started on preparations for driving the Pan-American hwy. and actually as crazy as it may seem, I would like to attempt to cross Darien Gap. Amazing post, as always! The photos are breathtaking! Unless you are a darn fool, stay out of “The Gap”. I spent two years down there in 1982 and 1983 when Noriega was taking over Panama. You can talk about adventure all your life, but when you are dodging AK-47 bullets and hiding behind a Mahogany tree until you can throw a few rounds of your own, that’s enough adventure. I am sure things have changed, but the Cartels have long memories. Stay out of there and let this tree hugging crap alone, unless you want your family to receive your head in a basket. Well said. I just hope to God people take heed of what you say. Sounds like stuff out of your worst nightmare. I don’t think they will ever find out what happened to that unfortunate young man. Please listen folks! I have enjoyed reading about all these adventures. I own a house in the Darien, in Jaque, which is the last chartered town before getting to the Columbian border 30 kilometers away. There are no roads so we fly down to Jaque. We spent eight years running the famous Tropic Star Lodge in Bahia Pinas which was an amazing experience and during this time decided to be the only foreigners to build a home in Jaque. We have made many wonderful friends over the years with the Wounaan and Embera indians of the area and have a good basket collection. Have hiked and fished and loved the area. Thank u so much for the ammazing story! It was so inspiring to read a story from someone who has actually been in this famous not-to-go spot! I will live in Colombia from August in Santa Marta that is really close to Panama and I wanted to see if it is possible somehow to cross to Panama overland! Do you know any tips for the opposite direction adventure? Yes. Just don’t do it. WOW…just WOW!!!!! LOVE YOUR ADVENTURES!!! This is one of the most elusive borders in the world! It’s every extreme travelers dream. Well done brother. Awesome photos Matthew! There is a great TED talk about the guerillas in Colombia which I’d recommend watching. I walk thru the gap in the mid 1970s. Took about 3 weeks, I had no idea there was nothing but jungle and Indians ahead. I was completely unprepared for the adventure and think it was the closest to dying I’ve ever had, including the 7 guns Ive had held on me including one to my head for a few hours in Columbia. The jumping off point was a construction camp with American engineers and a large number of Panamanian workers. They were building a cement bridge and on the other side of the river was a dense green jungle. The Americans invited me into their camp facilities which were air conditioned units with satellite TV and an open free kitchen ANDA hot showers. They told me it was all Indians in there and they were canibals so ” not wise to go thru”. I’d never been off the grid so it stopped me and made me think. I was a fugitive at this point wanted for murder as I had found out in a Time magazine in Belize a few weeks earlier thru a photo of Abbie Hoffman, of the Chicago 7 and I arm in arm with the caption “two fugitives from justice”. That was a shock that set me to take a trip before heading back for trial and to face the music. I had been cleared of charges while in LA, gave my Rolls Royce convertible to my lawyer as partial payment and headed to Belize to recover from losing my self made millions which I lost on my airline. The first price breaker in the USA, I had bought a DC9 to make air travel cheap for folks, a misguided venture ahead of its time. Anyway there was a fellow who was hanging around the camp , an adventure who was a New Jersy house painter who approached me and said he wanted to go thru and had asked thousands of folks but nobody would do it with him ( he did have a lousy attitude ) . He said it’s the Darien Gap, which meant nothing to me. We can make it he said do you have a gun? No. A machete, no. Drugs, no well you can’t have any of mine! I was a long haired ex hippie type just thru the economic ringer but recently on the Jonny Carson show for my airline. So I was looking fairly straight. Anyway we decided to go for it. I was in no hurry to go back to LA and by then had ripped up my passport and thrown it in the river running, very slowly thru Belize City on a full moon night. It took us 3 weeks of walking, each long day led to the next Indian village. It was not a park it was just a path thru the jungle. Each night we’d reach the next village, no electricity, no stores, no hotels just jungle Indians Kunas very friendly and isolated. Communal shelters, dirt floors rice, plantains occasionally we ate, or at least I did eat monkey. He had some cans of tuna. I was very unprepared in my sandals and shorts. Every night we would scan each other’s bodies to remove the ticks, my record high was 37- nasty blood sucking buggers! Pop them and your blood would shoot out of them. To remove them you’d hold a cigarette or match hot behind them, they would back out of your body and then pop them between your thumb nails. I saw a live snake must have been 16 feet long slithering across our path and each ISO,aged village had several snake skis doubled over and slit open that were the nat length, and they were thick too! Eventually we got to the swampy area, that was a real nightmare and the Indians were not as friendly. I had joined us up with a team of 6 smugglers that were going I to Co,Umbria I think they were bringing in guns and ammo, I couldn’t even lift the backpack made of wood and vines two of the smugglers were carrying. I could write a lot more but I wont. I’ve been thinking of writing a book which would cover much of my stories as everyone encourages me to when Ive been drinking and start telling stories. I made 30$ million of today’s money in 2 years back in ’69 when I was 26 years old, lived in India for 9 moths, lived with a film actress in Hollywood. Met lots of celebrities, Fonzy, Travolta, Jonny Carsom. Peter Lawford, Bernie Cornfeld, Roman Polansky etc etc. Been a millionaire to nothing 5 times and now just travel the world for going on 4 years. Thought I would sell my story at 99cents for 5 stories, all true! I have about 50 outrageous tales. It’s been a very eventful life I’m now 70 plus and stable with a wife of 30 years. Very strange. Hey Ken. Is this you? I have the most boring flaking life..
You should really write a book! I would love to read it with your incredible stories and aw a wife that’s great :) I am 19 and I really love listening to people’s stories of their travels ect, but if you write a book let me know thanks!!!! You should write a book, I want read it! Wow, dude you were in the news all over the place in 1975. Partied with Cher. So they don’t specify but what made you a whiz kid at wall street ? Hi, Ken–I’d like to offer my services in writing your story. Get back to me! WOW, this is one of the most amazing stories I ever read. If you look through the internet, there are a lot of stuff about Ken Moss life (try searching for “Freelandia Airlines” for instance). Someone should try to locate him and make a book or a documentary. Matthew, can’t imagine how thrilled you were to have this comment in your blog. I really enjoyed reading about your adventures, I’d love to hear more. Live vicariously through your stories, because I’m not so brave. I’ve traveled a lot. I love to travel. I’m 40, a RN for a huge hospital system in Houston, and traveling and animals are my passions. I’d love to read anything you have written. Also, kudos to you for all your work and accomplishments. I think you could safely say that!!! This is just to express my full satisfaction after having seen your amazing photos regarding the Darien Gap. From about july 1999 up to march 2000 ,I had set out to make a trip embracing the whole South America territory as I have started in the border between Argentina (my own land) and Brazil ,all the way up to Venezuela,and Colombia,only by highways and sometimes by hitch-hiking. As I was in Colombia I was told and encouraged to attempt another trip to Panama to which I regarded to be an intermediate point so as to go forward to Costa Rica and so on until reach the USA. Unfortunately when I was about to crossborder Colombia to Panama ,found myself in big trouble as I was suddenly adviced not to go beyond Colombia border as some political turmoil was in progress between Colombia and Panama,finally I was bound to resign and remain in Colombia. During these days I had also tried to make some arangement with colombian Trail trace guide men who wre supposed to lead me safe and sound to Panama with proper documentation .If I had gone with them I would nowadays be not alive to write this,for later was cleared that such a people were colombian smugglers traficking with drugs and the like. But something too much important was left behind ,I could not enter the Darien Gap which I was strongly longing to reach. Now thanks to your website gently displaying such excellent photos I can enjoy these places and still hope one day to be there . Thank you very much for your photos deployment. Hey Rodolfo, thanks for sharing your experience! Glad you enjoyed the photos. 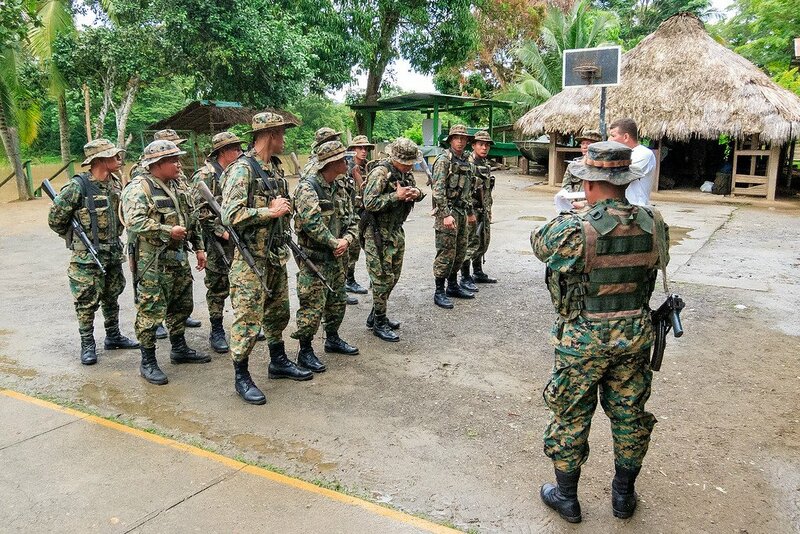 I too have heard conflicting reports about the Colombian trail guides. Some say it’s ok to go with them, others say they are dangerous. People still disappear down there on a regular basis — and cartel smuggling is still a big problem. Just watch the Movie of ” Indigeneous” and get to know this place. Anyone can tell me how real the content of the movie I just mentioned. Thanks. amazing photos! we are heading to South America this summer (had been there twice, but only Brazil, Chile)… if anyone else is interested to join I would love to connect with other people and try to make it somewhere into the Darien… please contact me if you are looking for two more people for this trip. It looks absolutely breathtaking! Great pictures of the Darien! I also went there for one month and a half last year and did some survival there, meeting wild animals and indians. It sounds like there are plenty of dangers in visiting the Darien Gap, but also lots of possible adventures. It really is off the radar, I don’t know many people whose goal is to visit. Most of my friends don’t even know what it is; I have to explain why I need to fly or sail into Columbia from Panama. Wow, these photos and stories are insane. I’m about to backpack from the US to Colombia, I was thinking of just taking a boat from Colon or somewhere since the Gap is basically unpassable, but now I’m wondering if it might not be worth the trip to head down there for a few days and then just backtrack if I have to. Very inspiring man! I spent about seven months in the army in the area in 1945/46. The war was over by the time I came the area but we were to operate a radar Station 8 for one hour a day just upriver from Pinogana to make sure it would be available if needed. Our transportation was a 30 foot piragua carved from a single mohagany log with a 22 horsepower Johnson outboard and would really travel on the river. Our supply boat could not get past El Real so we would have to meet the suppley boat and bring our supplies to Station 8 by piragua. With little to do we found many activities to eliminate boredom, like exploring the area, catching alligators (small ones), enjoyng our pets like monkeys, dogs, etc., joining the locals in some of their activities in Pinogana. Th only villages we visited were Pinogana, El Real and Yaviza. Yaviza was the most interesting. It even had a small store where I once bought an Orange Crush. It was the most busy because the Indians upriver from Yaviza would bring bananas in their piraguas to the banana boats. Some of us appeared in a newsreel because we helped them to get from El Real to Yaviza. This newsreel can be found on YouTube by searching for ‘1946 bananas indians.” I am the second person in the piragua taken by the movie cameraman who we put up front so he could see the river ahead on the way to Yaviza from El Real. All the other scenes were take in Yaviza except for a few taken a short distance above Yaviza at some indian homes. The people in the villages were Africans who, I was told, who were brought to Panama by previous countries who tried to build the canal but failed because of diseases but were not returned to there homes. The indians lived in family groups upriver from the villages – apparently where the bananas were. Though it seemed there were bananas everywhere. Jungle living was interesting. Most of our mail was dropped from airplanes. We has wonderful pets, like Gussy, our spider monkey was very friendly and loved by all of us. She had probably been brought from birth in the compound because she would never leave the compound. If you tried to take her out you had a fight on your hands. She was terrified of the jungle. She could not peal her own banana. Someone always did it for her. Wow Merrill! Thanks for sharing! I love hearing all these wonderful (and crazy) stories about the Darien. It really is a special place, even today. I can’t wait to go back. Amazing!! I couldn’t find the YouTube video? Great story and photos. Having been to Panama and Colombia I have always been fascinated by the Darien. How close to Colombia had you traveled before being turned back by Panama’s Security Forces? Absolutely stunning photos. Thank you for sharing a peek into this mysterious area. Thanks for sharing these truly amazing photos and insights with the world! I was always wondering about this region, not much news is really getting out. We had to ship our vehicle around the Darian Gap, as do thousands of other travelers every year (thankfully it looks like the will be a ferry from the end of the month onwards). Matthew, these are such amazing photos! Fantastic essay! I’m just wondering what you photography setup is? I’m a photographer as well I’ve yet to decide on good setup for traveling. I’d love to bring my whole DSLR kit but it’s way to heavy and would be quite the financial risk. I was using a Canon 7D for this adventure but I’ve switched to a Sony A7. Smaller, lighter, and with a full frame sensor. I am traveling to Panama Oct 3 – 10th. Where is the headquarters located to check in and ask for permission for hiking through the Darien? It’s the Senafront Base in Panama City. That’s where you need to get permission first. Sorry to bother you again, Matthew, but I forgot to ask a question. I have looked for, but have not found it anywhere. What was the Darièn Gap called in the 1940’s? I was under the impression its current name was named after some recent (1950’s?) explorer or trekker to the area. Today, the Spanish name for the area is “Tapòn de Darièn” or simply “Tapòn”. Have you found anything different? Thank you for taking time to reply to my comments. Your photo essay is extraordinary! It helped me tremendously as I am writing a novel in which the last 30% or so deals with the Darien Gap area in 1943. I would love to be able to go down there and look over the area on which I am writing, but at 69 years old and partially handicapped that would be nothing short of foolhardy on my part. I have been to Colombia many times as my Colombian wife’s family is in Cali. The setting for my story takes place along the Panamanian-Colombian border north of Capurgana along the coast as well as inland. I just wanted to let you know that in addition to your photos being beautiful, they have given me a basic feeling for the area and I am thankful! Glad to hear Jack, happy that these images are helping you complete your novel. Good luck! Thanks for the excellent photos about this interesting area — thankfully there are such areas left in a world that is being ever more infested and destroyed by humans. Whatever keeps it wild seems ok to me. Thankfully we have people like yourself who can appreciate and share it with others. My favorite places are often these types, those that haven’t been overrun with tourists or aren’t written about much. I agree, there are less and less of them every year. But it can be a dilemma, because when I write about them, it entices more people to visit, thereby creating those situations. Do you know of any plans of extending the Pan-American Highway through the Darien gap? They keep talking about it, but it never happens. What an adventure of a lifetime! Hi, I am a student in college and I have to do a report on Panama and I chose to do the Darien Gap…could I use your photos for my presentation slideshow as long as I properly credit them? Sweet photos btw, glad to see that someone is still getting away from modern society to learn about the less well-traveled parts of the world. Sure Ryan, send me an email from my contact page. I have to do a project on the Darien Gap and I wanted to ask you what would be the best time to visit? I could not find any up-to-date climate graphs anywhere so I really need help with this. I loved your website so far! Keep up the adventure! Did you make it to Colombia Matt ? No, I wasn’t trying to cross Omar. Crossing overland is almost impossible these days. You’ll quickly get arrested, unless you completely avoid all villages, which I wouldn’t do unless I had military training in jungle survival. It is possible along the coast though. Love the photos. Particularly the children. Wow, that frog was a really cool find! 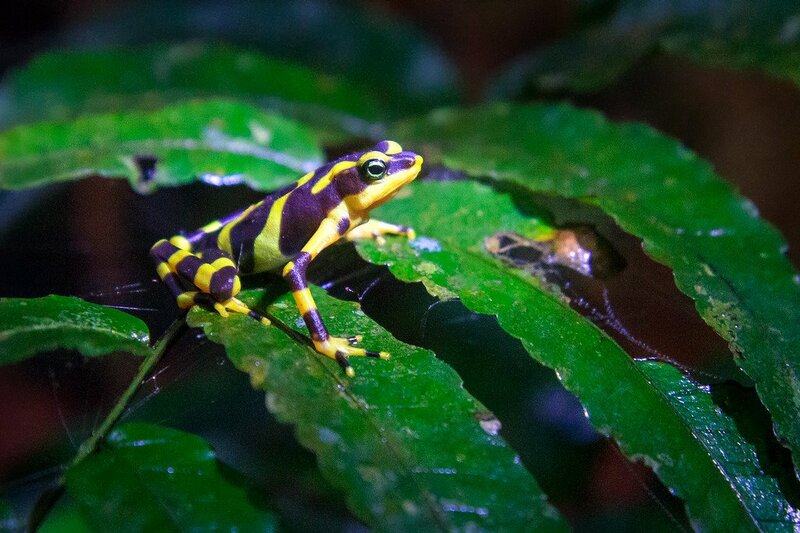 It is not actually a poison dart frog, but most likely an Atelopus varius, one of two species of “golden frogs” in Panama (Atelopus varius & Atelopus zeteki “La Rana Dorada”). Frogs from the genus Atelopus are all disappearing in the wild, so it is awesome that you were able to see one. Visited Panama couple of years with the family and I wanted to go back and visit the Darien Gap. Your photos and story inspired me to look into it again, it looks a “little safer”, but as you say, everything changes all the time. What an amazing tale and great pictures. It seems to be such an incredibly dangerous place yet going through the jungle sounds like quite an adventure. I love the wildlife shots especially of that frog. I can’t remember the name of though although I have seen them in zoos before. I remember they are incredibly dangerous, I think they are one of the, if not the most poisonous thing to man. Yup, some of these guys can be dangerous. I guess in captivity they loose most of their toxicity. It comes from their diet in the jungle. I just keep reading these over and over. I love the photos and information. WOW what incredible photos Matthew!!! Thank you Jessica. It’s difficult to take a boring photo in a place as enchanting as the Darien. Awesome! I finally see the story in photos. I remember you telling us about this in Colorado. It used to be more dangerous than it is now, yet it’s still important to be careful. Even with permission I was restricted to certain areas. The soldiers won’t let you go anywhere too sketchy — they kicked me out of a village called Boca de Cupe. But the situation there is always changing. Looks amazing. I love jungle trekking and because the Darien gap is not your typical tourist destination makes it even more appealing. Do you need a guide to trek in the NP or can you go by yourself? They won’t let you into the park without a guide, and before you can even get close you’ll need permission from Senafront to get past the roadblocks. It’s doable, but takes time & patience. Cool! Thanks for bringing this to us. Definitely a place few of us will ever get. Had to be such a crazy adventure mate. I would love to spend some time in this wilderness. It was. Every day was full of new things to see and learn about. I could have spent weeks out there without getting bored. Lions and tigers and bears, Oh my! Forget those guys you got chunga trees, poison frogs and who knows what in the water!!! Seriously, amazing photos – took me back to when I was kid and basically glued to all things National Geographic. Thanks! Always look forward to reading your posts. Good to see a traveler willing to get into some real adventures. Sounds like a great trip and I’m glad you brought back some really great photos. I especially liked the girl in the rain…sweet! I think I’ll definitely have a hard time trying to top this experience. Photos are way too cool. Heading to Ecuador in 9 days. Would love to visit their Amazon areas, but not this trip! That sounds great Mike! I’d love to make it down to the Amazon eventually. Fantastic photo essay! Really enjoyable read with great photos! Awesome photos! The Darien Gap has been on my radar for years. I have explored a lot of Panama but have yet to venture there. I would love to take that kind of adventure. Even a short distance into the Gap would be a rewarding, experience. Unfortunately, I have only been to Central America twice and I am going back this January of 2015. I would definitely need to have a guide and a little bit more knowledge before I even attempt a small portion of the Darian. I want to get away from all the tourist and see a part of the world people have less seen. Your photo diary was an inspiration. Now it’s February. Did you make it to C.Am.? Would be cool to see your photos!